“We shall not enter Palestine with its soil covered in sand, we shall enter it with its soil saturated in blood,” threatened Egyptian President Gamal Abdel Nasser on May 8, 1967. Only 22 years after the Holocaust, the world remained silent as Israel’s Arab neighbors broadcast their plans to wipe the nascent country off the map and push its 2.5 million Jews into the sea. A sense of dread and fear spread over the Jewish people, in Israel and abroad. Cautiously, Israel began mobilizing its troops. Civilians dug trenches, filled sandbags and taped their windows. At the direction of Israel’s military rabbinate, municipal rabbis scouted fields and parks that could be repurposed as Jewish cemeteries. In America and around the world, fellow Jews donated money, collected supplies and prayed. Then Egyptian military movements began. On May 18, 1967, Nasser formally requested that the United Nations Emergency Force—which had patrolled the Sinai Peninsula for the previous decade—pull out of the Sinai and Gaza. Within hours, U.N. Secretary-General U Thant announced that he would acquiesce. Egyptian forces immediately took over the U.N. positions. “As of today, there no longer exists an international emergency force to protect Israel,” gloated Radio Cairo. On May 22, Nasser closed the Straits of Tiran to Israeli shipping, blockading Eilat, the country’s lone port on the Red Sea. Israel had previously warned that it would consider the closure of this vital international waterway an act of war and vigorously protested once again. Meanwhile, the international community dithered, declining to offer security guarantees. “War might be an opportunity for the Jews and for Israel to test their strength against ours,” Nasser goaded in the speech announcing the blockade. With hundreds of thousands of Arab soldiers massed on three sides, what the world predicted would be a devastating war for the Jewish people was on its way. Tensions were growing and frantic parents with children studying in Israel turned to the Rebbe—Rabbi Menachem M. Schneerson, of righteous memory—asking whether they should bring their children home. Others asked about delaying travel to the Holy Land. 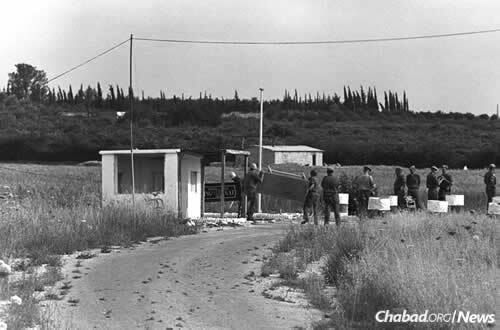 To each inquiry, the Rebbe responded with his assurance that everything would turn out well in Israel, insisting that students there continue studying and that travel plans remain unchanged. “The Rebbe answered my father that I should ‘not be afraid, nor frighten others,’ ” relates Rabbi Sholom Ber Hecht, who was a 19-year-old student at the yeshivah in Kfar Chabad at the time. “You have merited to be amongst thousands of Jews in the Holy Land, the land which G‑d’s eyes are constantly watching [Deuteronomy 11:12]. Certainly, the L‑rd of Israel will neither slumber nor sleep. 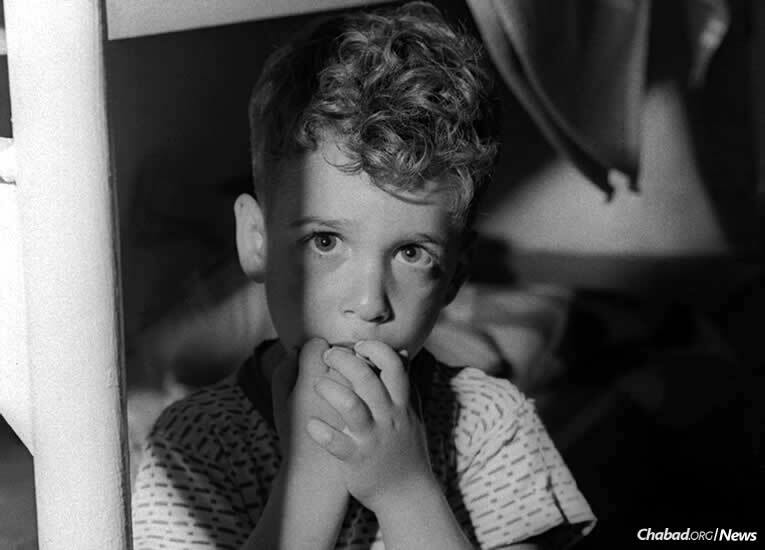 With G‑d at your right side, G‑d will protect [you] and all of the children of Israel . . . from now and forevermore. Meanwhile, the U.S. State Department stepped up its warnings. Rabbi Shmuel Rodal, then a 22-year-old native of Montreal studying with Schwartz at Torat Emet, received a ticket home from his worried mother. “She said she has a few sons, but only one Shmulikel,” recalls Rodal, today a Chabad emissary in Milan, Italy. Parents of other students sent similar entreaties to their children. 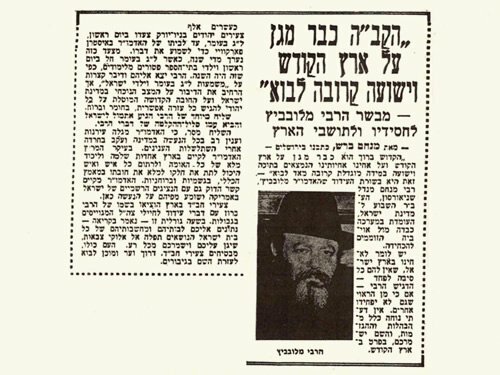 News of the Rebbe’s support in the face of otherwise dire predictions and mournful reports spread quickly throughout Israel, and were carried in every major Israeli newspaper, including Yediot Achronot, Maariv, Haaretz, Hatzofe and Davar. Even Al HaMishmar, a virulently anti-religious paper aligned with the socialist Mapam workers party, published the Rebbe’s telegram. While the government had tried to calm nerves by blacking out news of the foreigners streaming out of the country—indeed, the airport was full of people leaving for home, or flying to Cyprus or Europe to wait out the war—it grasped onto the Rebbe’s lone words of reassurance. Chabad Chassidim certainly had their answer. But now, with the widespread publication of the Rebbe’s blessings and assurances that things would turn out well, other non-Chabad rosh yeshivahs, rabbis and communal leaders felt they could advise their students to stay, too. As a result, many more Jews who had planned on leaving made the decision to remain with their brothers and sisters in Israel. Your brothers and sister in the Holy Land, the Land of Israel, are currently in a situation where G‑d is protecting them and sending them His blessings, success and salvation in an added measure so that they may emerge—and they will emerge—from their current situation successfully. You have the unique privilege to help them. Every time you study one more verse of Torah, and through your performing another Mitzvah and another Mitzvah—without missing any opportunity to do so—and through “Loving your fellow as yourself,” influencing your friends and relatives to also use every opportunity to spread Torah and Mitzvos, then . . . it brings him G‑d’s increased blessing for salvation and success. And then it will be fulfilled that which we read in yesterday’s Torah portion: “You will dwell securely in your Land,” the Jews in the Land of Israel will dwell there securely. “And I will place peace upon the Land,” G‑d will draw down peace upon the Holy Land. “And I will be your G‑d,” G‑d will be our G‑d and the G‑d of all Jews wherever they may be. “And you will be for me a people,” every one of you, and all of us together, and especially the Jews in the Holy Land, will be G‑d’s people, whom He will lead with His “full, open, holy, wide hand” out of all difficulties, and He will bring them peace and security in everything they need. And very soon will be fulfilled the verse of last week’s Torah portion: “And I will lead you upright,” G‑d will lead every Jew and all Jews in upright posture, with heads held high, very soon, in the true, complete and full Redemption through our righteous Moshiach, who will come soon and will take us—and especially the Jews in the Land of Israel—out of this exile. In the crowd stood Rabbi Yosef Wineberg, a prominent Chabad scholar and activist who for decades taught Tanya (the foundational text of Chabad philosophy) on New York radio. He was certain the Rebbe’s words meant the impending Middle East war would result in a victory for the Jewish people. Later in the day, he came to the office at Lubavitch World Headquarters and found out that a tape of the Rebbe’s words that day had been mailed out to Israel. Feeling that under the circumstances the people of Israel needed to hear the Rebbe’s assurances as soon as possible, he grabbed a copy and dashed off to John F. Kennedy airport, searching for someone flying to Israel. The El Al airlines gate was nearly empty, but there he saw Rabbi Dr. Haym Soloveitchik, the son of Rabbi Joseph Ber Soloveitchik, rosh yeshivah of Yeshiva University and a renowned Talmudic genius known to many as “the Rav.” The younger Soloveitchik was returning to his studies at Hebrew University following the passing of his mother earlier that year. 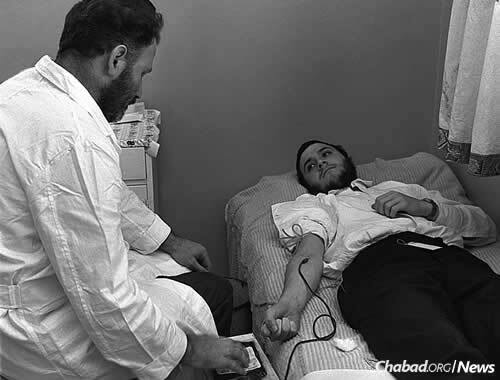 Years later, in an interview with JEM, Wineberg, whose 19-year-old son Avrohom was studying in Israel at the time, recalled giving Soloveitchik the tape and telling him it contained good news for the people of Israel. On arrival at Lod Airport the next day, Soloveitchik was greeted by Rabbi Berke Wolff, an energetic young Chabad Chassid who promptly set about publicizing the Rebbe’s words throughout Israel. Wolff also delivered a copy to Israel Radio, which promptly broadcast the Yiddish-language recording with simultaneous Hebrew translation. “ ‘G‑d Is Already Protecting the Holy Land and Salvation Is Near’-The Lubavitcher Rebbe’s Message to His Followers and to Israel’s Citizens,” proclaimed Yediot Achronot’s May 31 headline. 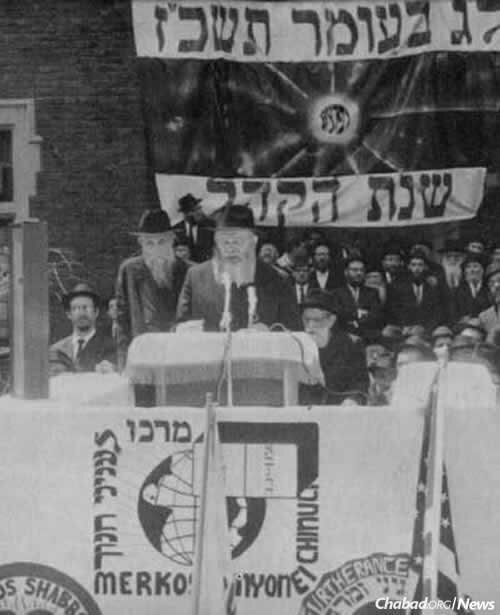 Five days before the war, a pamphlet addressed to “our brethren the soldiers of the Israel Defense Forces” was published by Tzierei Agudas Chabad of Israel containing the Rebbe’s words to the people of Israel and those directed specifically at the soldiers. The pamphlet said that the soldiers’ strength came from G‑d, who would protect them, and quoting from the Exodus, they would see the great miracle of “the children of Israel marching out triumphantly.” With the assistance of the chief rabbinate, 100,000 copies were printed and distributed by the military throughout their ranks. Amid the general feeling of dread and the restless anticipation of war, young soldiers and seasoned veterans reported feeling buoyed by the support. 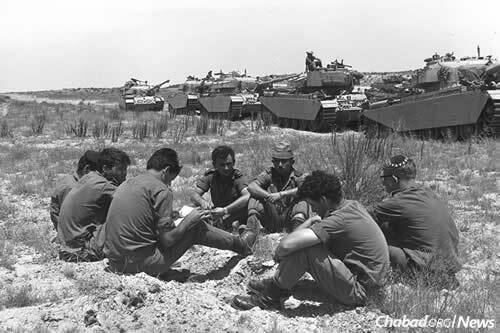 There for the long haul, the foreign yeshivah students promptly enlisted in civil defense. In Kfar Chabad—where a large percentage of the married Israeli Chassidim had been called up to the reserves, leaving women, children and the elderly—they dug trenches and organized study programs for the children, whose schools were not functioning properly. 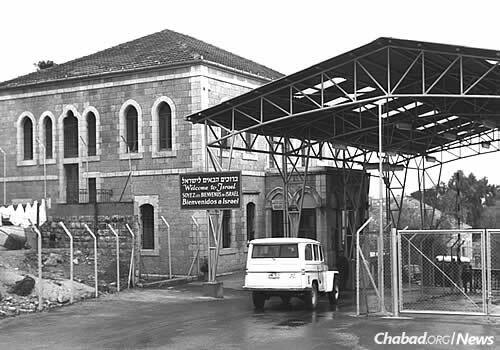 The Palestine Liberation Army, based in Egyptian-occupied Gaza, had announced plans to carry out terror attacks in Israel’s heartland, and Kfar Chabad, which had suffered a devastating attack 11 years earlier, needed a security detail. And so the young men were given turn-of-the-century British bolt-action rifles and trained to use them. “The truth is that the first two days of the war, Egyptian radio was saying their commandos were coming across the border,” remembers Hecht. In reality, the Egyptians never even got close, even as their mortars flew overhead in the airport’s general direction. In Jerusalem, however, the battles were close, and ultimately, the bloodiest of the war. 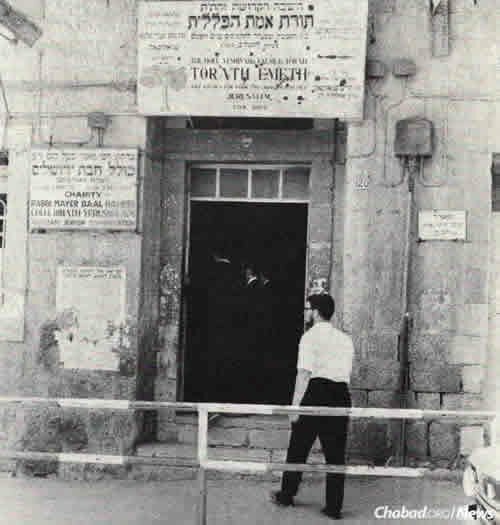 Rodal and Schwartz’s yeshivah was in the old Mea Shearim neighborhood, a few hundred meters away from Mandelbaum Gate, the makeshift 1948 border splitting Jerusalem into a Jordanian side and a Jewish one. 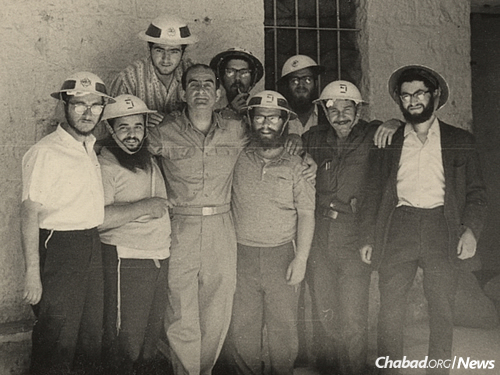 The yeshivah’s office had been turned into the local civil-defense headquarters, and, like their friends in Kfar Chabad, the young students enlisted. Mere blocks away, abutting no-man’s land, was the haredi Batei Ungarin neighborhood; the Yiddish-speaking Chabad students were placed at the helm of their civil defense. They trained for two days before throwing themselves into their work, directing the civilians of Batei Ungarin to do so as well. Later, during the actual war, they delivered bread and milk to the men, women and children huddled in the neighborhood’s basement shelters. Behind Torat Emet was a large courtyard in which the Israel Defense Forces set up an artillery battery manned by 30 soldiers. 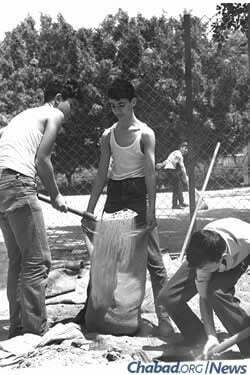 Each morning, the Chabad students would go out back where the troops spent their daytime hours filling bags with sand to distribute around the neighborhood. 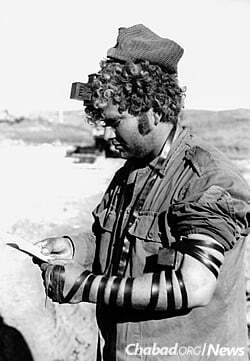 The yeshivah students would wrap tefillin with the soldiers, who, young and scared, welcomed both the distraction and the comfort the prayers offered. In a videoed talk of his memories of the Six-Day War, Schwartz recalls the battery commander, a sabra named Yossi, opposing the tefillin. A compromise was struck: One yeshivah student would fill sandbags while another would wrap tefillin with a soldier. The two groups got especially friendly on Shabbat, when the Chabad students—instead of yelling at the non-observant soldiers for not adhering strictly to Jewish practices—came laden with cake and carrying bottles of spirits. “We said l’chaim. Then we started singing. After a few l’chaims, we started dancing,” remembered Schwartz. “We did this for two Shabboses in a row. We got to meet the people, to know their names.” Speaking in Los Angeles 48 years later, he recalled one soldier named Yaakov Shachar. That Shabbat, in New York, the Rebbe spoke about the importance of tefillin, saying, in Yiddish, “my point is not to simply lecture, rather—as in all areas of Torah—this must be brought into action. 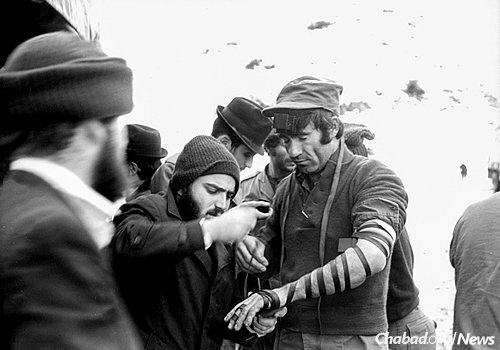 In connection with the current situation in our Holy Land, you should endeavor, intensively, that as many Jews as possible should put on tefillin.” In calling on soldiers to perform the mitzvah, the Rebbe quoted the verse “the nations of the world shall see that the name of G‑d is upon you, and they will fear you,” adding that the Talmud explains this refers to tefillin. 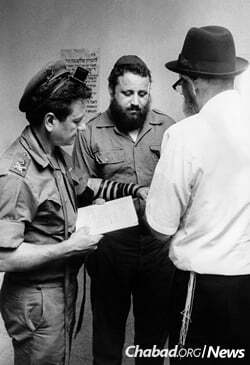 A telegram relaying the Rebbe’s message was received in Israel immediately after Shabbat, and its content was also publicized to Chabad Chassidim, who were tasked with spreading out and putting on tefillin with their fellow Jews, and to the soldiers themselves. On Monday morning, June 5, war began with Israel’s pre-emptive airstrike on Egypt. Within a few hours, the Jordanians were shelling Jerusalem. Blocks away from Jordan, Mea Shearim and the nearby neighborhoods’ stone streets came under heavy fire for two days. The yeshivah itself was directly hit twice, blowing a hole in the roof through which Schwartz was able to see the sky above; it was streaked with pink. The artillery battery behind the yeshivah was targeted by the Jordanians, and on the second night suffered a direct hit, killing two soldiers. The night had been hell, but by early Wednesday morning Israeli tanks were moving through the city, taking the war into Jordanian-occupied Jerusalem. In those dawn hours, Yossi, the commander, came into the yeshivah. Pulling out a 50 lira bill for charity, he asked that a ner tamid, an “eternal light,” be kindled in the yeshivah bearing the names of the two young men who had been killed hours earlier: Yaakov Shachar and Shvartz. Surrounded, outnumbered and outgunned, Israel won the war days later, a victory military analysts deem miraculous. Even at this early stage, it was clear that the war’s momentum was on Israel’s side, but the tragedy of the loss of each individual soldier was already apparent—to the men of the battery as much as anyone else. It was approaching 6 a.m. by now. Schwartz gently asked Yossi if wanted to put on tefillin, who this time nodded his agreement. A few streets away, Israeli soldiers prepared to enter the Old City and reunite the Jewish people’s eternal capital. In Mea Shearim, a Jewish warrior quietly wrapped tefillin, whispering the words Shema Yisrael.